It’s not the first and it probably won’t be the last snow day of 2019. While schools and many workplaces are closed for the day due to extreme weather, that doesn’t mean the work day ceases to exist! 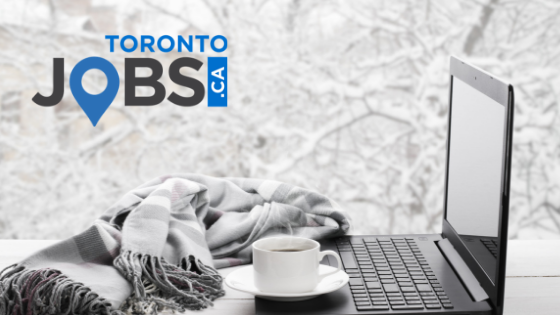 If you’re anything like our TorontoJobs.ca team, you’re settled in at home with your laptop (in your pajamas) while the snow continues to fall outside. CARVE OUT A DEDICATED WORK SPACE. This spot, whether it’s an actual office in your home or simply one end of your dining room table, should be set up specifically as a work space. That means none of your kids’ toys or extra clutter. Keep the spot stocked with a water bottle, notebook and pens, your laptop and/or any other materials necessary for you to complete your work. If you have kids home with you, set up a “work space” for them as well. That might mean preparing (quiet) activity stations including a colouring and simple craft area, building block area or an area for books and puzzles. COMMUNICATE! Just because you aren’t physically with your team at work doesn’t mean you shouldn’t be in constant contact. Respond to emails as quickly as possible and be sure to keep the team or your supervisor updated with projects you’re working on. If you need to run out and shovel the snow for a half hour or tend to your kids, be open about that as well. STICK TO YOUR USUAL SCHEDULE (as much as possible). Your day at home will never be exactly the same as a typical workday, but you should try to mimic the usual schedule. If you typically start the day catching up on emails, for example, followed by a conference call at 10 a.m. and special projects from 1-3 p.m., you should make an effort to follow the same breakdown of your day at home. PRIORITIZE WORK AND HOME TASKS SEPARATELY. It’s easy to be distracted by dirty dishes in the sink, that looming hamper full of laundry and the snow piling up outside on your driveway. To avoid having those niggling tasks bleed into your list of work tasks while at home, be sure to create separate to-do lists. Rather than ignoring certain tasks, add them to your lists as they pop into your head. You’ll be surprised how much easier it is to manage everything once you have it on paper! HAVE REALISTIC EXPECTATIONS. Above all, you need to be realistic. Putting pressure on yourself to have an even more productive day than usual might be setting yourself up for failure, for example. Instead, use your to-do lists to prioritize tasks and guide the breakdown of your day. If you have kids, don’t bank on them taking care of themselves for eight hours straight. Instead, build short stretches of time into your day’s schedule that allows focus on them between other tasks. From the TorontoJobs.ca team, have a cozy and productive snow day! For more job and workplace related content from TorontoJobs.ca, please click HERE.